Picture a mild mannered retired technical writer who has been given a large box containing a disassembled jet fighter and a user manual, a man who had watched the Blue Angels flying overhead but had never seen inside one of the planes or even considered flying one. And yet, yet, a man so consumed with curiosity that he thought, oh, why not? Actually, in my case the box was small and contained an almost completely assembled DJI Mavic Pro drone, a handful of accessories, and a Quick Start Manual. And yes, even though i’d never seen a drone up close and certainly had never tried flying one, i’d been wanting one for some time to get to vantage points from which i might take better photos, particularly of bridges. So its arrival was hardly a surprise because i’d ordered it online. But as soon as it arrived, i realized that i was sitting at the bottom of a chasm of ignorance so deep that i hadn’t even known that operating the damn thing would require downloading a controller app onto my smart phone, an instrument itself about which i’ve barely learned the basics, and then attaching the phone to the Remote Controller so the phone can display what the drone is seeing. Ahhh, so that’s what those two legs on the bottom are for. Because we’ve been living in a surveillance state for our own good since 9/11, i had to register my new sUAS (small Unmanned Aircraft System) with the FAA and agree to follow a set of rules so ambiguous that it looks to me like merely taking the drone out of the box is potentially actionable. And then there was the discovery that my old Samsung S4 phone, which had been behaving so badly of late that i’d recently paid forty bucks to have it “repaired”, was limping along so weakly that it wasn’t up to the demands of flying a drone. So i went ahead and replaced it with a Samsung S8, nearly doubling the effective cost of the drone. This also meant spending a day setting up the new phone well enough to be able to install the DJI GO 4 app to operate the drone. Fringe benefit: i learned how to install an app on my phone. Then all i had to do was follow the instructions, a task made somewhat more difficult by that profound pit of ignorance but compounded by inadequate user manuals. I spent a few minutes devising appropriate punishments for the authors of those user manuals, starting with the floggings just to get their attention. Ahh, but wait, then i remembered being a technical writer required to print my user manuals before the damn application would actually work right so the finished manuals could be shipped with the product. Thus, i was writing anticipatory documentation in the hope that it would work the way the programmers were promising it would. So i’m sure these manual writers are in the same position, which gets them off the hook although the bottom line is that their manuals, like mine did, have problems. But i kept blundering along and, after several days managed to get the drone to take off in my living room. Very cautiously, just to demonstrate that i could. And landed it immediately with a great surge of joy (that i was able to do it) and relief (that i didn’t fly it into something and break both). This morning i took the drone out to an empty tennis court at the top of Holly Park and practiced flying it around. Need to do this a few more times to develop an intuitive feel for the control knobs so that i can rapidly make changes in altitude and direction without having to think about which thumb does what. Next, i’ll have to figure out how to use the built-in camera, which is clearly going to be a lot more difficult than just flying the beast. Just as well it’s going to be raining for the next few days since i’ll be tied down inside to user manuals and tutorial videos. The rest of the story is that i got busted in the middle of that practice. I heard somebody calling my name and looked up to see Linda peering at me through the chain link fence. Out letting her dog run in the park and spotted me. She’s one of my neighbors in the old folks’ home, so now everybody knows. Yeah, it’s a very friendly place … and it’s a village. 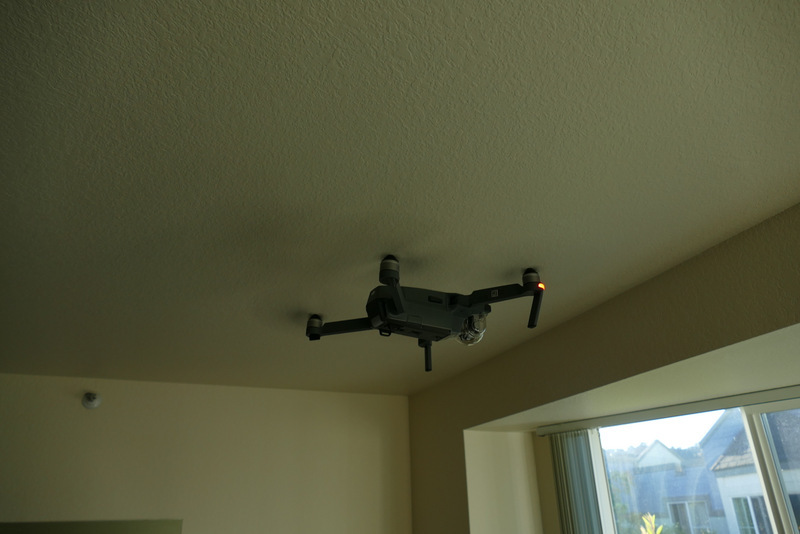 Meanwhile, exhibit A, the drone hovering about six inches below the ceiling in my livingroom. Yeah yeah, looks like it’s hanging from the ceiling, but it’s not.